Crush ¼ cup berries in a bowl with a fork. Add creme de cassis (or juice), lemon juice and sugar, stirring until sugar is dissolved. 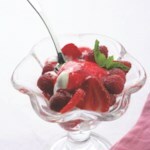 Add the remaining 2¾ cups berries; stir gently to coat. 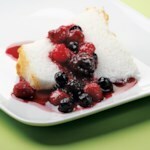 Place a scoop of sorbet in each dish and top with the berry mixture.